In their third consecutive trip to the Premier League of Belize (PLB) finals, the Police United FC team has finally broken the “bridesmaid jinx” that has dogged them for the past two seasons. In their first championship final about a year ago, Police lost to Placencia Assassins in the 2011-2012 Closing Season. 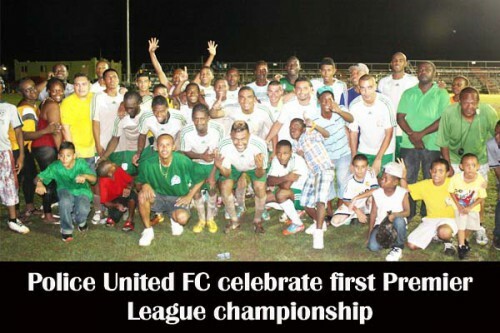 Then in the 2012-2013 Opening Season, which ended earlier this year, it was Belmopan Bandits taking the crown, and leaving the other finalist Police United FC to again settle for 2nd place. In the previous two competitions, Police united had finished the regular season at the top of their group, but in this latest Closing Season, things looked very questionable for the Police team as they suffered a 4-game losing streak mid-way in the competition, and were in doubt about making the playoffs. But the lawmen rebounded with a 3-game winning streak, coupled with a successful protest that overturned their 3-0 loss to Placencia Assasins, and thus the Police entered this season’s semifinal playoffs as the 3rd seed. The fortunes for the Police Team took a positive turn in the playoff semifinals, as they twice defeated the 2nd seed BDF team who had beaten them twice in regular season. Their opponent in the finals would be 4th seed FC Belize who had shocked defending champion #1 seed Belmopan Bandits, beating them 1-nil at the MCC, and holding them scoreless at the Isidoro Beaton for the 1-nil aggregate victory and a spot in the championship finals. Game 1 of the finals at the MCC last Sunday, May 19, saw Police gain a 1-nil win over FC Belize, on a second half goal by their young captain Andres Makin, Jr. The potentially game tying goal 10 minutes later by FC Belize’s veteran midfielder Norman “Tilliman” Nunez was not only nullified by a late offside call, but Tilliman’s subsequent appeal to linesman Ricardo Ake resulted in him being ejected by referee Irfan Basdemir. Going into game 2 of the finals on Saturday, May 24, the loss of Tilliman was considered a major blow to the FC Belize attack, who were low this season in the goal scoring column, and depended on the incisive passing of the veteran star to spark their offense. FC Belize would also be without stalwart right defender Jorje Estrada, who suffered a serious ankle injury late in game 1 of the finals, and would be unavailable for the last game. It rained hard the whole of 1st half on Saturday night at the FFB Stadium for the final leg of the PLB championship finals, and it started on the “good foot” for FC Belize, who took an early 1-nil lead at the 3rd minute on a diving header by Michael “Suit” Hernandez from a centering pass by FC Belize’s other veteran midfielder Mark “Kelo” Leslie. That resulted in an aggregate 1-1 tie, and the score remained the same into the intermission, despite powerful shots from Police’s Lennox “Criminal” Castillo and Amin “Tacos” August, Jr. at the FC Belize goal, which were handled by goalie Glenford Chimilio. The half-time acrobatic show put on by Police number one fan, Corporal Aaron “Gambis” Gamboa helped to lift the spirits of Police fans and players; and a strategic half-time change by coach Andres Makin gave the Police team a better handle going into second half. Armando Dubon was having some difficulty on the left flank for Police in first half, and Makin sent Trevor “Burger” Lennen, who started in midfield, to man the flank, while Delroy Flores, who substituted for Dubon, filled the gap left by Burger in midfield. Burger helped to lock down the Police defense, ably anchored by sweeper Kishane “Grill” Pech, and Delroy displayed good control and passing alongside another outstanding veteran Orlando “Leechi” Jimenez in midfield to keep the Police attack going. On FC Belize’s side, young Avian “Chiches” Crawford played an outstanding game in midfield, but coach Marvin Ottley had limited options, having to bring back the talented Ryan Gill from midfield to fill the right flank vacated by the injured Jorje Estrada. And injuries would prove the undoing of the courageous FC Belize squad, who saw their other midfield veteran Mark “Kelo” Leslie, playing with a cracked rib, having to leave the game early in second half. And then it was their stalwart defensive stopper Luis Arriola who was battling with a groin injury and struggling to stay in the game. Arriola, who had played a whale of a game in first half and early second half, repeatedly breaking up Police plays, was visibly limping and unable to get back on defense, when Lennox “Criminal” Castillo, who created havoc for the FC Belize defense all night, drew sweeper Leon Jones and left flank Matthew Leal enough to create space for Danny Jimenez on the right side; and Criminal’s pass was on the money for Danny, who had time to pick his spot, and drive home the tying, and what proved to be the series winning goal at the 30th minute of 2nd half. Too little too late, Arriola was immediately substituted by the more offensive minded Leon “Lem” Jones; but goals are scarce on a wet pitch, although the rain had stopped in second half. And that’s how it ended, 1-1; with Police the aggregate 2-1 victors and thus champions of the Premier League Closing Season 2012-2013. It was a very intense and well officiated game. We can’t recall any cards being issued in this one. After the match, the victorious Police team and fans made a joyful victory lap around the FFB Stadium, while a cluster of loyal FC Belize fans in the bleachers cheered on their defeated squad with a strong display of appreciation for a gallant effort. FC Belize: Glenford Chimilio (GK), Matthew Leal, Leon Cadle (captain), Ryan Gill, Luis Arriola (Leon “Lem” Jones at 76’), John King, Kristian Perez, Mark “Kelo” Leslie (Jason “Paxon”Young at 60’), Stephen Baizer (Khambrel Blease at 83’), Michael Hernandez, Avian Crawford. Coach, Marvin Ottley. Police United FC: Keith Allen (GK), Armando Dubon (Delroy Flores at half-time 45’), Kishane Pech, Glenn “Tipu” Martinez, Amin “Tacos” August, Jr., Devon Makin (Highking Roberts at 82’), Orlando “Leechi” Jimenez, Trevor “Burger” Lennen, Andres Makin, Jr. (captain), Daniel “Danny” Jimenez, Lennox “Criminal” Castillo (Jeremy Bermudez at 86’). Coach, Andres Makin, Sr. Referee: Gerald Henry, Jr. Assistants: Daniel Catzim and Ricardo Ake. 4th Official – Nelson Jones. Match Commissioner – Marlon Tillett. Referee Assessor – David A. Jones.